Last week, our studio member had her 30th birthday. To celebrate this glorious date, we decided to organize a huge thematic battle! The motto was simple –to hit Chaos in the weak spots. Well... yeah, you cannot annihilate them all but at least you can try to weaken them. So, the unified armies of Order including Bretonnia, High Elves and Lizardmen stood against the Mortals and Demonic forces under the rule of mighty Tzeentch god. The battle took place in the Chaos Wastes – rocks, mountains, demonic statues and the desecrated watchtower had been waiting for the brave, yet, foolish warriors who dare to invade the domain of Chaos Gods. However, the alliance army of good forces did not cringe in terror. In their hearts were peace and confidence, driven by the sheer need to destroy the evil once and for all. The Lady of the Lake was with them. The Old Gods from Lustria drove javelins of Skinks and leads them in the Azyr lore of magic. Noble and pure High Elves mages casted destructive balls of fire one after another, whereas their sharp and accurate archers and ballistae overwhelmed sky in arrows and bolts. The Chaos army was a truly dreadful view for any mortal being. The sky was filled with shrieking creatures and mighty daemons. Fast and vicious hounds had waited for an easy prey. From the North came ill-famed Chaos Knights wearing armours so dark that they could be covered in dried blood of their victims. Even the dreadful Giant was widely seen on the battlefield! At the end, when the sun arise on the horizon, the victor had been hardly known. The over mighty forces of evil were still strong and outnumbered their opponents but trained eye of a bystander knew that the evil aura was weakened. The game ended with a draw! Only 80 pts was lacking to the minor victory of unholy forces of destruction. The grand battle was played according to the rules of 6th edition Warhammer Fantasy Battles that were slightly changed. Our home rules were solving some miscellaneous situations from the pure 6th rulebook. We also add some rules from the older editions that were adapted to the 6th. Specially for this occasion, Witek, who led the Chaos Forces along with Thorash, had painted Giant. The blue colours of its skin shows that his general really likes Tzeentch. Even Thorash prepared Exalted Daemon for this game. He converted the old model that he had done long ago with the wings taken from Cockatrice and a head from a Cold One beast. 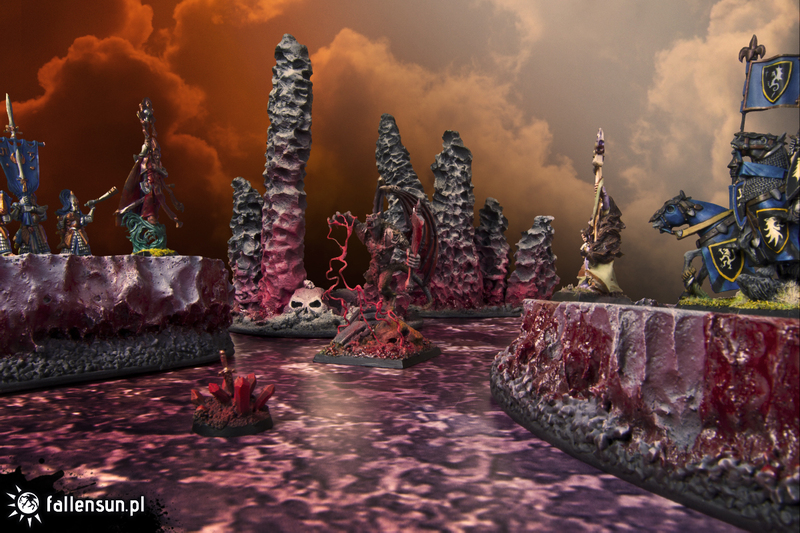 You will see it soon in our next entry on the Fallen Sun blog. Repeater Bolt Thrower in one strike swept away Exalted Daemon from the sky. One of the Exalted Daemons of Chaos was completely burned by the Aqshy spells from the High Elves general. Aspiring Champion of Tzeentch aka “Łysy”, from “Banda Łysego”, crushed in the challenge the Saurus Scar-Veteran general from Lizardmen army. In the first turn of magic, the noble elfish general had problems with concentration, and every mages that attempted to cast a spell failed. Not a single spell was successful, even when the good forces had 21 Power Dices. The similar incident occurred in the second turn as well. The horde of Saurus Warriors scurried away in terror spread by the Exalted Daemon. The unit of White Lions did not pass the panic test from the magic assault of Tzeentch flames and fled off the table. Our birthday girl received a beautiful handmade t-shirt with the illustration of the famous Green Knight of Bretonnia. This present was specially designed by our friend Witek, who led the Mortals into the fight. Amarell proudly wore the t-shirt during the battle as you can see on the photos. "Thank you my friends from the bottom of my heart! I want to specially give acknowledgement for being on this day with me and playing such a fantastic battle! Thank you so much Sowa, Witek, Miklas, Thorash and others who could not be with us. Gifts from you are awesome and I cannot wait to use them in the X-Wing game!"